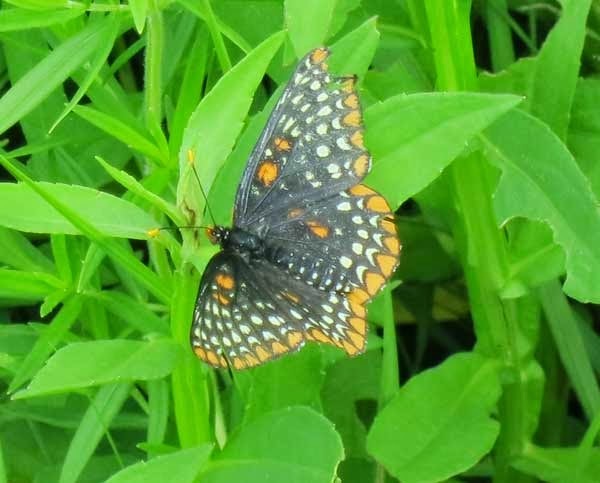 The primary larval host of the Baltimore checkerspot (Euphydryas phaeton) is the White Turtlehead (Chelone glabra), a species of marshes, sedge meadows, and wet prairies. Turtlehead is native to Pleasant Valley Conservancy. It seems to be favored by wetland burns and flourished extensively in the sedge meadows after our first wetland burn in 2005. It was shortly after this burn that butterfly aficionados reported the presence of Baltimore checkerspots along the lane separating the Crane Prairie from the wet sedge meadow. Although Baltimore checkerspots are not common in Wisconsin, they were very prolific at Pleasant Valley Conservancy during the last two trips (2013, 2014) led by the Southern Wisconsin Butterfly Association. They were especially common this year in the Valley Prairie area. In past years we had not seen turtlehead in the Valley Prairie, but because of the checkerspot findings we anticipated finding them. Also, both the Valley Prairie and the marsh near it had good burns this past spring. Indeed, Amanda and Susan have been successful in finding quite a few flowering stems of this attractive plant in both locations. Note added: according to the Illinois flower web site, checkerspot larvae in their later instars may move to and feed on swamp lousewort, a species that is prolific in our wetland. This may help explain the extensive populations at Pleasant Valley Conservancy. Bur oaks are amazing trees! Long-lived, powerful, fire-resistant, and providing great ecological support for a wide range of creatures. In fact, many long-lived bur oaks are not giant trees, but small ones called grubs, only a few feet tall, but with quite large root systems. Yesterday we were in the middle of an extensive woodland sunflower survey when Kathie discovered this small but powerful bur oak with two good-sized acorns. It is growing right out of the dolomite on the East Overlook. It's hard to know how old this tree is, and it is interesting to speculate how it survives. Its root system should be quite interesting. Bur oak grub growing out of the dolomite, with two acorns. The East Overlook has always been one of my favorite spots at Pleasant Valley Conservancy because it gives great views out over the valley, the prairies and savannas, has a lot of interesting rock formations, and is surrounded by a very nice grove of open-grown bur oaks. 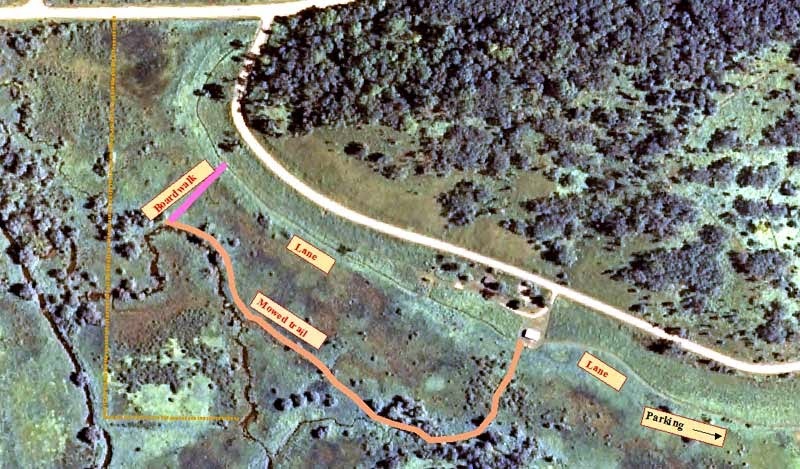 The Short Loop Trail (reached by this link) goes right by the East Overlook in either direction. The Monarch butterfly is a species of great conservation interest. The survival of monarchs is linked to milkweeds. Monarch caterpillars eat only milkweeds, and monarch females lay their eggs on milkweed plants. 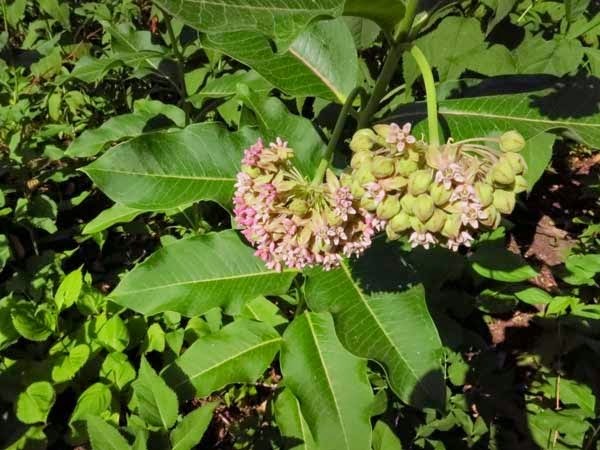 Because milkweeds are becoming scarce on the landscape, environmental groups are encouraging the planting of milkweeds. The easiest to plant and raise is the common milkweed, Asclepias syriaca. However, other milkweed species also support monarchs, as well as other butterfly species. We don't need to plant milkweeds at Pleasant Valley Conservancy because our prairies and savannas support extensive native populations. The table below lists the seven species we have. The only one that is not native to the site is butterfly milkweed. The most common milkweed at Pleasant Valley Conservancy is, of course, the common milkweed, which is the species that most conservationists are planting. This species establishes well and because it is clonal, it easily forms large patches. 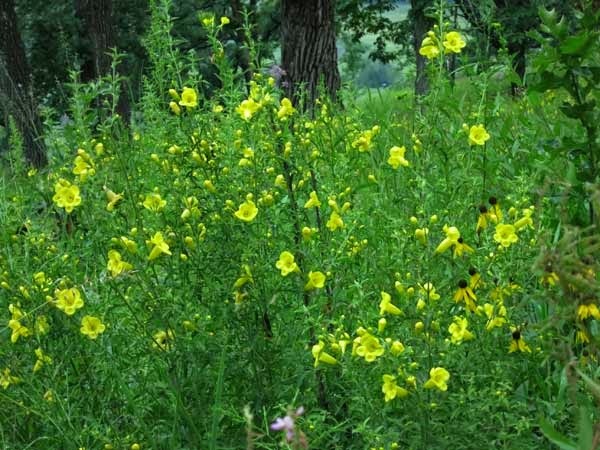 Also, it has a wide habitat tolerance, growing well in both prairies and savannas. At Pleasant Valley Conservancy it does especially well in our oak savannas, and I estimated one clone in Unit 11C at almost an acre in extent. Purple milkweed, a State endangered species and one of the signature species at Pleasant Valley Conservancy, seems to be especially preferred by monarchs. When we were doing research on this species we established a milkweed forbs garden where all the species in the table except short green milkweed were planted. The monarchs went preferentially to the purples, ignoring the other species that were growing nearby. In order to protect our purple milkweed patches, Kathie monitored them and moved all developing monarch caterpillars to a nearby patch of common milkweed. I have made several improvements to the Pleasant Valley Conservancy Trail Map. The link here gives access and a low-resolution version is shown below. Also, the web site has access to a high-resolution version that can be downloaded. Among other improvements, the base map air photo is the latest available (from 2013), and has been enhanced to make the savanna areas stand out. This link leads to last year's Blog Post where I present information on the 2013 base photo. For those with iPads, the high-resolution PDF can be downloaded and saved in a form accessible in Adobe Reader. The advantage is that you don't need to have Internet access to see the map in the iPad. Go to the App Store (or Google Play for Androids) and search for Adobe Reader. Download this app and check to be sure it works. 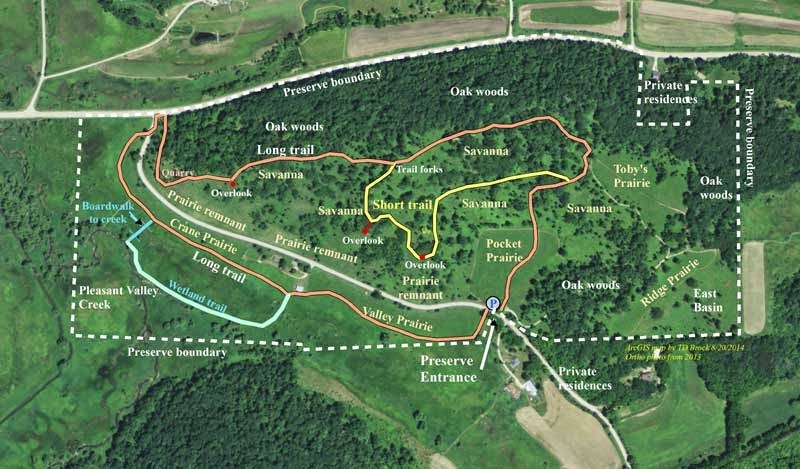 Go to your browser (I use Chrome) and open the page in the Pleasant Valley Conservancy web site which has the trail map. Tap on the link to download the PDF version. The map should come up in your browser. Tap the lower right hand corner and select the option to open the map in Adobe Reader. (Ignore the other options.) The map should now be full screen in Reader and a double-tap should open up an even larger version, which you can move around with your finger. You now have a high-resolution map that you can carry with you on your hike. This map will stay permanently in your tablet. We finally found time to remow the wetland trail that forms a loop between the end of the Boardwalk and the barn. The interns did this on their last day, assisted by Amanda, Susan, and Ben. With all the rain we have had this summer the trail was fairly overgrown, so it took all morning to get it in shape. The map shows the general route. Starting at the Parking follow the lane along the Valley Prairie until you get to the barn, where the mowed trail starts (or ends). At the end of the mowed section follow the Boardwalk back to the Crane Prairie, where you pick up the lane again. Follow the lane to the end of the Crane Prairie, then go back to your car along Pleasant Valley Road. (A bit over a mile walk.) This gives you a chance to see the wetland both closeup and afar, and also enjoy the tallgrass prairie on the south slope. A pair of cranes has been present all summer. Also, while mowing the trail the interns and Susan saw a Blanding's turtle (Emydoidea blandingii), an endangered species. 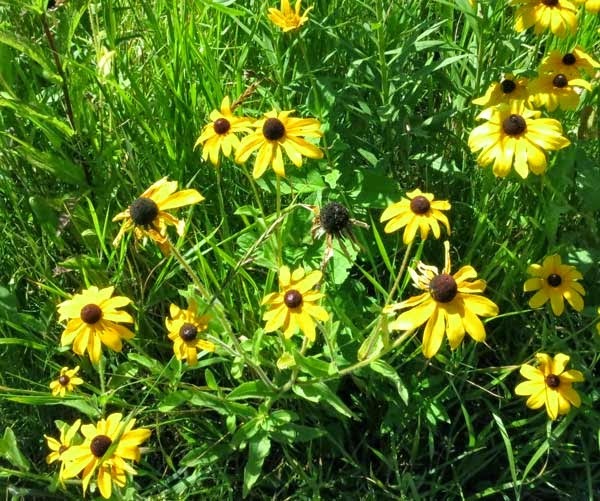 In our area there are four species of Rudbeckia that might be present in a remnant or restoration. Also, Ratibida pinnata is generally present and may sometimes confuse things. These species are commonly called coneflowers or black-eyed Susans. In the field it may be difficult to decide which is which. Because most of these species are planted in native plant gardens, there are numerous cultivars, often with additional names (for instance Rudbeckia hirta ‘Autumn Colors’ ‘Indian Summer’). Many of the commercial plant and seed companies don’t provide enough detail to permit easy identification. Ratibida (yellow or gray headed coneflower) is the most straightforward to distinguish. Its ray flowers always hang down and its disk flowers are tall and compact, providing a characteristic flower structure. Rudbeckia laciniata (cut-leaf coneflower) can be distinguished from the other Rudbeckia species because its disk flowers are yellowish or grayish-green rather than purple. 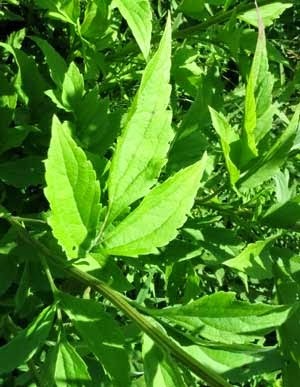 Also, it lives in moist places and shores and its lower leaves are pinnately divided. Although laciniata is listed in Czarapata’s book as a potentially invasive species in the upper Midwest, we have never seen any evidence of it getting “out of hand” at Pleasant Valley Conservancy. It was already present in our wetland when we first started restoration, and has never “taken over”. It is a tall plant and provides a nice backdrop in the wet prairies. Rudbeckia triloba (brown-eyed Susan) is easily distinguished because its lower leaves are tri-lobed. Also, its flowers are smaller, with the ray and disk flowers both shorter than the other species. Rudbeckia triloba is a short-lived perennial which establishes well and readily self-seeds. Once planted in a prairie it should continue as a colorful species for many years, even though it may move around. 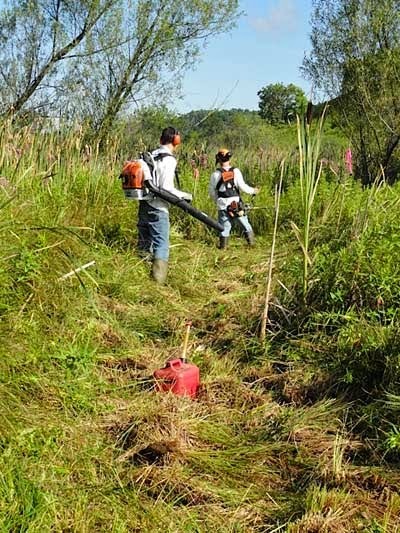 Some Wisconsin “purists” question whether it is “native” to our region, since it can often be found in disturbed habitats. However, our experience at Pleasant Valley Conservancy is that it is well behaved, and provides an attractive color late in August when many other species are starting to fade. It also does well in the more sunnier areas of the savannas. Finally, we need to separate hirta from subtomentosa. hirta has a simple narrow leaf, whereas subtomentosa has a dissected leaf, as shown in the photos. As always with leaf shape, the lower leaves tend to be more reliable than the upper ones. Even then, leaf shape can often vary, so that this character is not always reliable. The best character, from my observations, is the stem. hirta’s is stiff and hairy, whereas subtomentosa’s is smooth and glabrous. Run your hands up the stem and feel the difference. 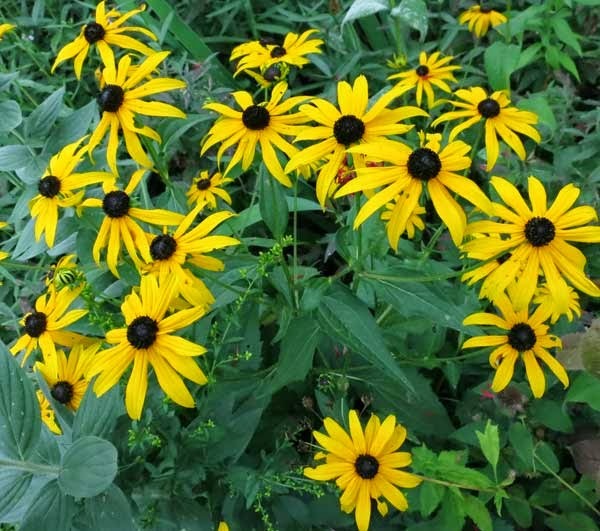 Rudbeckia hirta (black-eyed Susan) is an annual, biennual, or short-lived perennial. Some botanists consider it an “aggressive weed”, but you will find it in almost every planted prairie in southern Wisconsin. 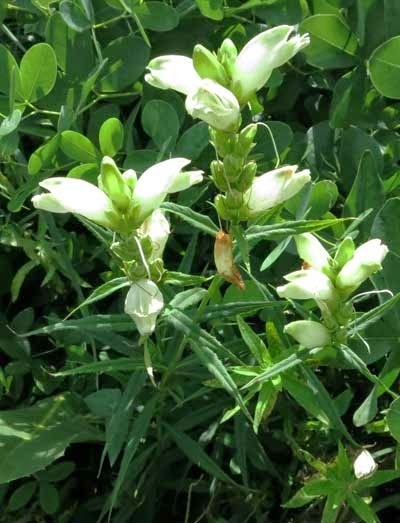 It is very reliable in a prairie planting, easy to establish and provides guaranteed color by the second growing season. A single patch may not persist but it seeds well and should remain as a long-lived member of the prairie. R. subtomentosa (sweet black-eyed Susan) is a long-lived perennial. At Pleasant Valley Conservancy we never knew we had this species until it was recently pointed out to us by a visitor. Sure enough, we found quite a bit of it in the Barn Prairie as well as in the wet prairie nearby. Where did it come from? Seed heads of these two species will be quite similar, and it seems likely that seeds of both species could easily end up in a single mix. So we undoubtedly planted it accidentally. 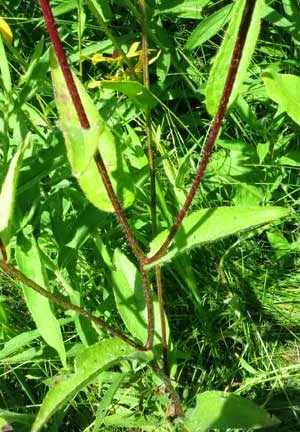 According to the Herbarium records, it is found mainly in southwestern Wisconsin, along the lower Wisconsin and Sugar rivers. However, with so much prairie planting going on these days in Wisconsin, I suspect those restrictions will no longer apply. Large-flowered false foxglove (Aureolaria grandiflora) is one of the great members of the oak savanna flora. Its savanna dependence derives from its absolute requirement for parasitism on roots of members of the white oak group (white and bur oak). It is generally fairly showy but this year populations are especially lush. In Unit 10, where the oaks are primarily burs, there are large populations. We first established this species at Pleasant Valley Conservancy about 10 years ago, planting seeds under the drip lines of the oaks. Within two-three years small populations of flowering plants had developed, and they have gradually spread across the savanna areas. This species is a member of the Orobanchaceae family (formerly Scrophulariaceae), a group with a number of hemiparasitic species. In addition to Aureolaria, genera in our area that are hemiparasitic include Agalinis and Castilleja (Indian paintbrush). According to research done by Musselman (American Midland Naturalist, Vol. 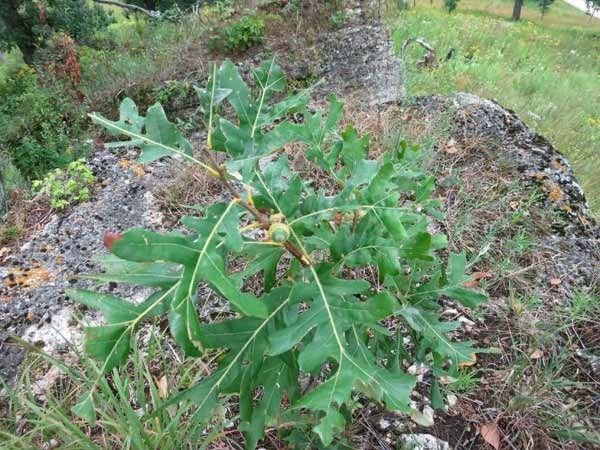 82, July 1969), seeds of Aureolaria germinate normally and start to form seedlings, but unless they parasitize an oak rootlet they seldom get past the cotyledon stage before dying. Although Aureolaria grandiflora is an obligate parasite on oaks, it does not do any harm to the tree. It primarily "infects" the tiny roots that are present under the drip line of the canopy. The especially prolific growth this year is probably linked with the unusual summer weather we have been having (fairly cool and good rainfall). Why aren't compass plants flowering this year? I have been unable to find any work in the literature on this phenomenon in S. laciniatum, although there is work with other species. In some species, all (or virtually all) of a single species in a population will flower, and none at all the next year. In some cases, this cycle will be repeated again, and perhaps again and again. So the question is: how do plants know when other plants (of the same species) are flowering? At Rettenmund, this is the first year I have noticed that flowering has not occurred. Certainly, for the past four or five years we have had good flowering. Why this year? Note added 8-11-2014. I just learned yesterday from Mark Martin at Goose Pond Sanctuary that their compass plants are not flowering this year either. This makes me think the phenomenon must be weather-related. 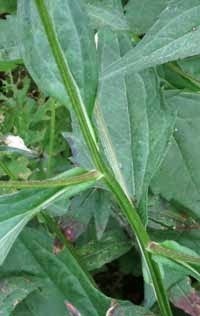 The compass plant consists of two parts, the greatly dissected basal leaves, and the thick, robust flower stalk that often grows quite tall and carries the flowers. My information is that the flower stalk arises (separately from the leaves) from the thick basal crown. Thus whether or not a plant will flower depends upon differentiation of flower primordia in the crown. Although I have found no data on this, I assume that the trigger which starts flower stalk differentiation occurs the previous fall. If a stalk primordium does not develop, then no flowering occurs. 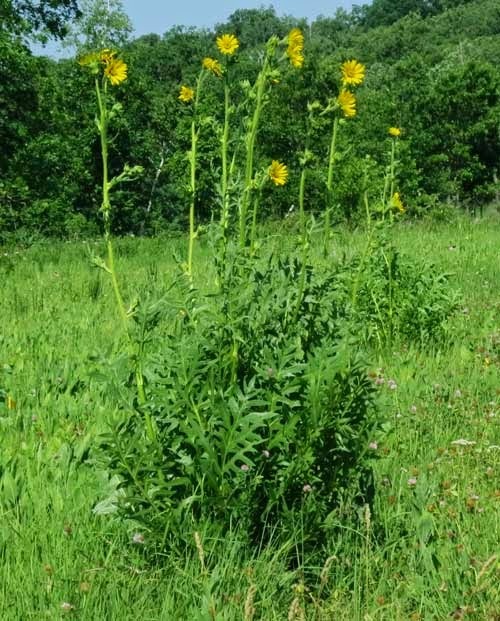 A multi-stemmed (9) compass plant in the middle of Toby's Prairie. Note that all the significant foliage is basal. Although very little flowering is occurring at Rettenmund, we have normal compass plant flowering at Pleasant Valley Conservancy. Thus, it seems unlikely that we can blame this on bad fall weather, or bad winter weather, or bad spring weather, since Rettenmund and Pleasant Valley are only 4 miles apart. At the moment, all I can conclude is that compass plants at Rettenmund are having an "off" year. We'll have to wait to see what next year develops.